Georgia Mae (Starks) Conwell was born on April 6, 1939 in Marion, Alabama to George and Lula Mae Starks. She was baptized at an early age and graduated from Lincoln High School in Marion, Alabama. Georgia was a homemaker who devoted her life to raising the children and caring for the home. But her nurturing didn’t stop there, she continued care for the grandchildren as they came along. She enjoyed playing cards, going to the casino, playing Bingo, listening to her Blues music and spending time with her children and grandchildren. She was member of Haven Missionary Christian Church where Rev. Isiah Merriweather is the pastor. On Tuesday, November 27, 2018, she departed this earthly life at Parkview Regional Medical Center. 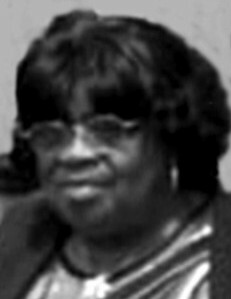 Georgia was preceded in death by her parents, George Starks and Lula M. Brown; husband of 54 years, Thomas Conwell Sr.; siblings, Sybredia Lapsley, Pearlie Mae Starks and Ethel Armour, aunt, Pearlie Peggins, nephew, MacArthur Starks Jr., grandson, Joseph D. Conwell and granddaughter, Niomi Joelle Cox. Her love and memory will live on through her loving children, Carlton D. Starks, Ronald T. (Lorraine) Starks, Gladys M. Starks, Anthony L. (Dionne) Conwell Sr., Joseph A. (Rochelle) Conwell, Jerome S. (Carmen) Conwell, Sandra V. (Wilbur) Brantley, Lashanda S. (Shequaya) Conwell, Aaron C. (Breonda) Conwell and Teyonia Powell; siblings, Callie Bates, Roosevelt (Shirley) Starks, MacArthur (Willie) Starks, Willie (Nina) Brown and Elder Eugene Starks; a host of grandchildren, great grandchildren, nieces, nephews, other relatives and friends.